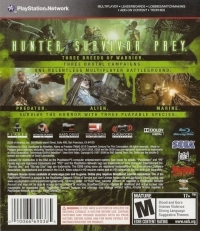 Box Text: HUNTER. SURVIVOR. PREY. • Three Breeds of Warrior. • One Relentless Multiplayer Battleground. 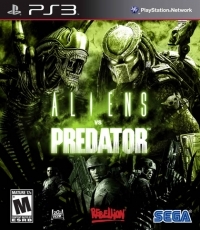 • Predator. Alien. Marine. Survive the Horror With Three Playable Species. 05-23-2017 silverbow Box Text HUNTER. SURVIVOR. PREY. • Three Breeds of Warrior. • Three Brutal Campaigns. • One Relentless Multiplayer Battleground. • Predator. Alien. Marine. Survive the Horror With Three Playable Species.